Of the many things you may try to leave behind in life guilt is often the hardest to shake off, with the consequences of past behaviour resurfacing in the present when you least expect it. This is a theme disturbingly explored in Ryan Oksenberg’s short Damage Control, which sees a man confronted by his previous actions during a trip to a run down house with his fiancée. DN invited Ryan to explain how location and cinematography combined with choreographed performance for this dark tale of a long overdue comeuppance. The ramshackle location seems to play a more significant role here than as a backdrop for events to play out on. Even though the point of view of the story is Drew’s, I wanted the audience to have the property revealed to them just as the property was revealed to Alison – blindfolded and for the first time. It was important for it to be written that way and directed that way. The property was Drew’s secret hideout to bring women. He knows this while nobody else does and that’s why the audience should never be ahead of him. This also explains the uneasy tone. We are walking through his crime scene but it’s filtered through this air of a new beginning with his fiancé. I was treating the place like it was the Overlook Hotel and it was “Shining” with memories of his sordid past… that we all know inevitably catches up with him. 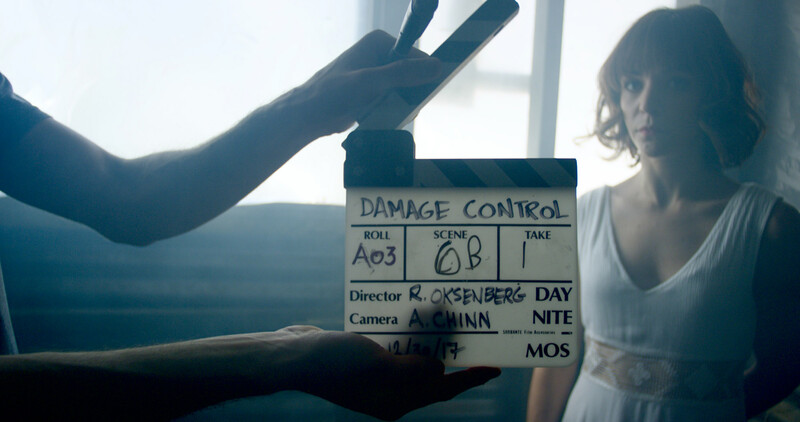 What were your considerations when casting the actors for Damage Control? Casting Clayton Farris as the Drew was probably the smartest decision I made on the movie. It was the easiest too. Clayton’s so likeable and funny and we needed that to disarm audiences. With the wrong actor Drew could’ve been unlikeable from the get-go and not given audiences that weird feeling of pitying him in the end. Clayton’s a dynamic actor that way. He did so much improvisation with Heather Geisler (who plays Alison) in their initial scenes together walking up to the property. I wanted to keep it all in because it was really charming. There’s a longer cut that exists with this improvisation but I had to chip away at it so I wouldn’t deflate the tension. If the character of Drew was abusive towards women in his past, then in his recreated version of himself, I thought he would date an alpha female. For the casting of Alison I wanted someone who was a hustler at work and then counterbalanced by a lover who is looser and goofier than she is. The woman in the shed (played by Ana Zimhart) took the longest to figure out. When I was initially kicking around the idea, I knew the woman existed in Drew’s past but is now a guilty voice in his head coaxing him to reveal himself. I realized I needed an actress who could exude strength but also there was a story in their eyes about what might have happened since it’s purposefully not in the script. Ana sent in a taped audition and it was spot on. She was angry, yet sad, vengeful yet merciful. We are walking through his crime scene but it’s filtered through this air of a new beginning with his fiancé. She was most difficult to edit because I didn’t want to reveal her up close right away, I wanted to keep her back, playing off the mystery she’d be to the audience. There was also finding the balance of playing her logically and playing her as a figment of Drew’s guilt. She has to be all about his comeuppance, but at the same time, show us the reality of what it may be like to break into a property and confront someone there. She has to struggle to keep her emotions in check while maintaining the strength and bravery to confront her tormentor. That final confrontation is indeed tense, how did you prepare Clayton and Ana for that? Individually, I had conversations with the actors and we discussed our boundaries and own intentions for participating in this film. I knew I was dealing with a pretty intense scene and wanted everyone to feel comfortable. While the shack was getting lit, Ana, Clayton and I sat down together for a safety meeting and ensured that there was never going to be any uncomfortable surprises once we walked onto set. We rehearsed and blocked several times and we all kept the atmosphere light and joked around. At each “cut,” I checked in with them and funny enough; they were having a great time and enjoyed the freedom of tackling the whole six-page sequence in a single take each time. The cinematography amplfies the unease we feel as the story progresses, what informed the film’s visual style? I brought my Cinematographer (Andy Chinn) and G&E (Joseph Tan) out to the property several times to scout and develop the aesthetic. Following through on the uneasy tone I wanted everyone to feel, Andy suggested all handheld shots. He would operate his Red Scarlett and suggested I hire an AC to pull focus wirelessly. Andy also had the great idea to shoot wide in the beginning, creating an airy space in the frame around Drew and Alison when he surprises her with their future home. Then, when Drew’s guilt gets to the best of him and he is put on “trial” so-to-speak, we get very, very tight and claustrophobic. After all, this is his confession. The last aesthetic was an ‘in camera’ technique I suggested. I was going to be cutting the picture and I foresaw how the timeline sequence should be: long takes at first, followed by a series of cuts that cut finer and finer and then diced by the end. This was difficult to pull off on a shoot that is relying on natural light, shorter winter days and only two days to shoot. We didn’t have any rehearsal – we just went for it and even shot the blocking. How difficult was it chreographing the realtime progression of the action within the restrictions of limited natural lighting? There are over a minute long takes that are handheld, moving to four different parts of the uneven terrain and where actors have to appear and disappear like theatre. To do multiple takes with movement and the elements (camera, performance, sound, weather) coming together was like a dance. I felt like I was getting away with murder each time we got one in the can that worked. It was very rewarding, but surprisingly difficult in the editing room choosing between fifteen takes, each one having their own strengths and weaknesses. There was the temptation to cut or hide cuts, but I stuck to my guns. To do multiple takes with movement and the elements (camera, performance, sound, weather) coming together was like a dance. Another challenge was daylight shooting. We shot for two days on December 29th and 30th of 2017 with about 10hrs of light. The whole film takes place over Alison’s lunch break. It all had to feel like one moment in time from when they pulled up to the property up until Drew is caught with his pants down. I had to strategize with Andy and Joseph beforehand when we would shoot what and at what time of day since the sun is always changing. Shooting in discontinuity was a lose-lose situation but our only choice. If we finished something earlier than we thought then the sun may not match for what was planned next, and if something took longer than expected then we were losing the light that matched another previously shot sequence. We had to reorganize our order of shooting constantly and I was shitting in my pants, because at times it felt like we wouldn’t have the right light for certain shots and I had $4,000 of my own cash riding on these two days of hiring a crew of eight that magically came together for these two days. As nerve rattling as that is, nothing is more fun than switching gears at every turn, problem solving and seeing the gift at the other side. What lessons did you take away from this project? You have to be open to change and new ideas and trust that your initial intention will always be with you to the end. I don’t know lighting, I don’t know how to act, but I know how to communicate my vision. Nobody will care about your film as much as you do, but if you hire people who care about their craft and stand by your script and you’re not afraid to ask them questions too, your film will be exponentially better. You have to trust and love your crew and keep them happy.